When selecting Easter basket candy sometimes it is hard to make up your mind what you would like to put in them. The choices are endless. There are more varieties of candy available for Easter then any other holiday. While kids of all ages love getting candy they also like to get some fun novelty candy included in their Easter baskets. It's like getting two treat in one. Please remember when picking out your treats to make sure they are age appropriate. Some toys are not suitable for young children. If that is the case stuffed animals, coloring books and crayons or story books are always a good choice. Here are some fun Novelty Candies for filling your Easter Baskets. These Easter pinball games are always fun to put in your Easter baskets, however they are not recommended for smaller children. You get a fun Easter theme pinball game and the handle is filled with Jelly Beans. These keeps kids busy for quite awhile. There are 3 different colors available of these games. 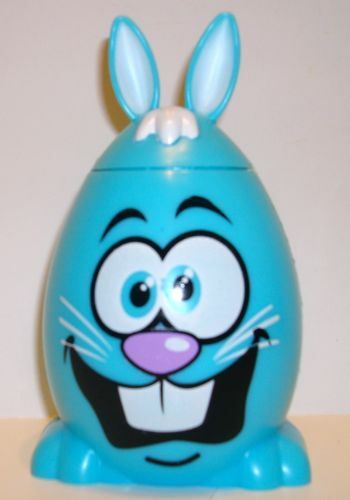 Kids love these goofy bunny plastic eggs. These are filled with jelly beans and have such goofy looks on their faces kids just giggle. They are perfect for placing in your Easter baskets. They come in bright colors not only making them a good basket filler, but also fun to hide. These bobbin bunny carrots are also a favorite. Each plastic carrot is filled with malted milk eggs. On top of the stem there is a bunny head on a spring making them bob their heads every time they are moved. These are another fun novelty Easter Candy that many of our customers used to hid instead of the traditional plastic candy filled Easter Eggs. For those bubble gum lovers we have plastic carrots filed with bubble gum eggs. You get a whole carrot with nothing but fruit flavored bubble gum eggs for hours of chewing. Although many kids of all ages enjoy gum, once again these are not recommend for smaller kids. Now this is a must have Easter basket candy. You can not make up an Easter basket and not put an Easter Pez in it. Kids and adults alike love these. The best part about these are you can always buy pez refills once the original pez candies are gone. Although we have many novelties to choose from these are our top sellers. We get many comments from our customers on what an success these treats were in their Easter Baskets. So many comments that we have tried to make things easy and have created and Easter basket filled with some of these candies. This Easter Basket for kids has a great selection of candy and novelty treats. We have also added an Easter theme card game, activity book and crayons to go along with it. 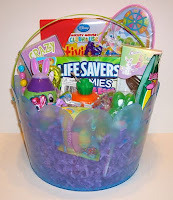 If you are running short of time or what to ship an Easter basket to that special little bunny we can help.